Viral conjunctivitis is an inflammation of the top layer of the eye and the interior lining of the eyelids caused by a virus. 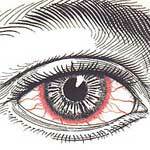 Usually only one eye gets infected and becomes red, swollen and dry. A patient might experience clear or yellowish drainage, especially overnight, and see a crust forming on the eyelids and lashes. Adenoviral conjunctivitis is one of the types of a viral conjunctivitis caused by certain types of virus. This condition normally starts as an acute respiratory case with coughing, sneezing and sore throat followed by developing of bloodshot eyes appearance. Viral conjunctivitis is highly contagious, therefore, it’s essential to sanitize all surfaces, wash clothing, bedding and towels in a hot water cycle. There’s commonly no medication necessary to treat viral conjunctivitis and it will run its course in about 5-10 days. Bacterial conjunctivitis is also an inflammatory process of the eye lining but caused by bacteria. The symptoms of a bacterial conjunctivitis are very similar to a viral conjunctivitis. Topical antibiotic drops are usually prescribed along with steroid anti inflammatory medication to help fight this infection. Both types of conjunctivitis greatly contribute to your bloodshot eyes causes, make you feel uncomfortable and down. Also there is a follicular conjunctivitis which could be caused by both viral and bacterial infections. There are simple home remedies you can try at home to make you feel better. Applying a warm wash cloth to the affected eye a couple times daily will soothe and help keep your eyes clean to prevent the crust forming on your eyelids. Using over the couther artificial tears and running a humidifier at home will help with eye dryness. Due to the symptoms of a viral and bacterial conjunctivitis being so similar, it had been virtually impossible for doctors to distinguish between these types until recently. It resulted in many unnecessary antibiotic prescriptions for viral cases. Now a new test has become available to check a patient’s tear drainage for adenovirus presence and make a correct diagnosis.